This beautiful VRBO is situated in a private park-like setting with ocean views from the deck, which is minutes to the beach and all amenities, including restaurants, hiking trails, lakes and bus routes. This newly renovated suite comes with a separate large bedroom with a queen size bed; a brand new kitchen with stainless steel appliances (stove, refrigerator, built in microwave and dishwasher), quartz countertops, Keurig coffee machine and an additional countertop oven) and a selection of coffee pods and various teas provided; large 10' high ceiling living area with a Smart TV (including Netflix, Prime and Bluetooth DVD player) and WIFI included for your enjoyment. Also provided is a pellet stove for cooler nights. Free long distance calls to Canada and the US are provided, if needed. Full bathroom with shower and tub. Top of the line washer and dryer is included which is shared with the owners use when vacant. Only 450 meters from the beach! See Mt.Baker and the San Juan Islands from the deck. See the beautiful view right from our comfortable deck! Your own private brand new kitchen with quartz counter, glasses, dishes, cutlery; sink, dishwasher, microwave, drop in oven, refrigerator; also counter top toaster/oven and Keurig coffee maker. This gem comes with: TV, Netflix and movies, microwave, counter oven, toaster, coffee maker with coffee, kettle with tea, hair dryer, dishes; Plus a tour to acquaint you with the area. If requested, private transportation to your Victoria BC tourist destination for only $20. Minutes to recreation centre. 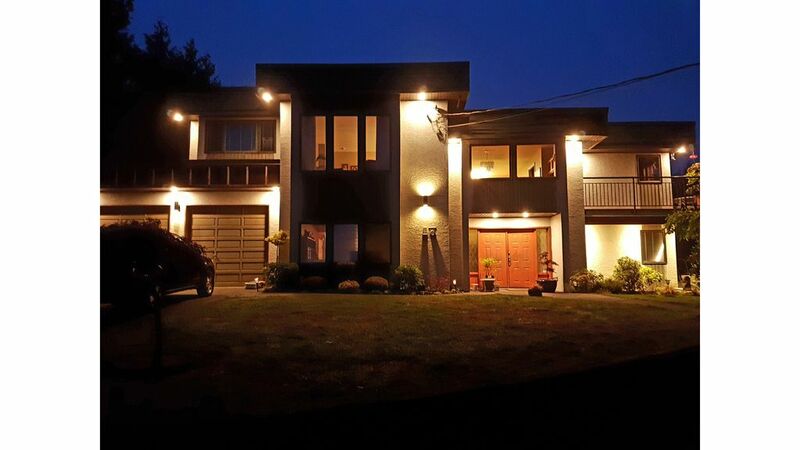 Minutes to Cordova Bay Golf Course, which will include free transportation if available. The location was perfect for our regatta needs and close to downtown. Lovely hosts in a beautiful home with outstanding gardens! We enjoyed our stay very much and would definitely recommend to others. Large bedroom and private sitting area (tv) and bathroom. Gorgeous yard and welcoming friendly hosts!! I needed a place to stay as I settled my daughter in for her first year at the Univ of Victoria. This lovely home was the perfect accommodation to fit my needs - and then some! The location is nicely situated on a hill overlooking Cordova Bay and I was only 15 mins from UVic, 15-20 mins to downtown Victoria, and 45-60 mins to just about anywhere else I wanted to go explore. Betty-Anne and Terry are incredible hosts and made me feel extremely welcomed. They offered their upper level deck for my use, which I visited every morning (the sunrise is incredible!) and a couple evenings. Such a lovely view of the bay between the trees. It is a 10 min walk down to the beach, but beware the walk back up is challenging - ha! There is public beach access and public transportation stops right at the base of the hill below the rental. They are adding a kitchen in early October, but I honestly didn't need any of the provided amenities (aside from the Keurig and mini-fridge) as there are so many wonderful places to eat very nearby. I do want to note this is probably considered "semi-private" as their main laundry room is located in the rental space and they do live on property full time. However, Betty-Anne and Terry were completely respectful of my space and advised when she would need to access the laundry (which they do try to do only on vacant days). The separate entrance, large bedroom, full bathroom, and comfortable living room area provide all the privacy you need to enjoy a lovely stay. I definitely will stay again when I visit my daughter over the next four years! We were in town for wedding festivities and needed a nice place to sleep and relax. I wish we would’ve had more time to spend here because it was a WONDERFUL experience. We loved being right up from the beach and our hosts were more than kind, generous, and charming. We will definitely go back! Thankyou so much Erin and Eli. So glad you enjoyed your stay with us,and we would love to see you again! The rental was great for us - very close to where we were visiting and it's in a lovely part of Cordova Bay. The bedroom was very comfortable and it was very nice to have the separate living room area with comfy seating and TV. Although there is no kitchen yet - I understand that it will be built very shortly - the bedroom area was well equipped with pretty much everything you needed to make a light breakfast, lunches, snacks. Betty-Anne and Terry were very gracious hosts. There were cookies, muffins and some soft drinks in the fridge when we arrived and they invited us to use the upper deck any time we wanted. Unfortunately it was a bit chilly while we were there, otherwise we would have. It is a lovely deck with a partial view of the ocean. If people want privacy there is an outdoor table and chairs on the lower level. We will definitely book again when we are back on our annual visit. We had a wonderful time staying in this property. Very nice, clean apartment and Betty-Anne and Terry are 2 of the nicest people you could hope to meet. Location is great, centrally located with everything close by that you need. When we come back to Victoria we will look here for availability. Thank you for sharing your home with us. The Munson's. Here in Victoria. Look forward to seeing you again. Only 5 minutes away from Broadmead Village Shopping Center!